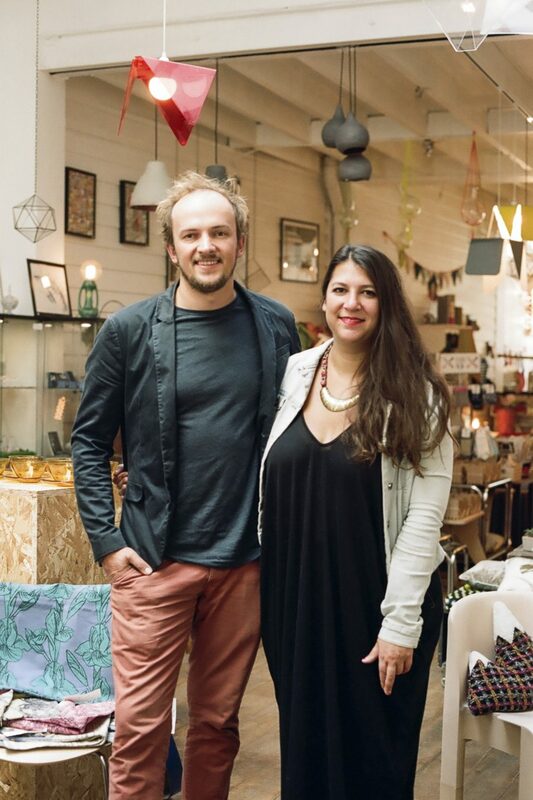 Natacha Filipiak and I are a couple who opened our Brussels-based concept store Belge une fois two and a half years ago. Before this, Natacha was a graphic designer while I was a production designer for commercials. We’d been planning on creating something together for quite a long time. Natacha has a strong background in work logistics, while I have manual abilities. We were confident that we would be able to make something powerful together thanks to our complementary skills and were keen to have fun each day by choosing our own lifestyle. Natacha is a very strong person to work with: when she decides on something, she puts her mind and body to it. At work I’m a bit of a lunatic – I’m most happy when I can use my hands to build something. In our shop, one of our favourite things to do is to interact with our customers. They share their suggestions and feedback, we laugh together – it’s a real pleasure to have that kind of friendly relationship with customers. Of course, we’re proud of our brand – it’s our baby. Our life has been truly special these last three years. Every day is different, and we know why. We’ve accomplished so much work – even if it can get tough at times – with great satisfactory results. The little kid always outside, playing in the streets and with a permanent runny nose. Belgian people are openminded and able to laugh at themselves. An important point, as it shows that we can accept judgement and get on with it. Jean-Claude Van Damme: you might think he’s a bit of a dummy, but he’s actually a really smart man. Roméo Elvis: an artist just living his life without thinking too much about the rest. He likes to play around with his image without coming off as pretentious. Stéphane de Groodt: a great example of the successful “Belgian touch” outside of Belgium. Well, it’s hard to choose, but I’d probably go for Restobières: it’s a restaurant serving loads of dishes with Belgian beers. It might not be the sexiest, but it has the real generous Belgian style. The Marolles neighbourhood for sure – one of the best places to go to on a Sunday in Brussels. And you can be sure to find the real spirit of the capital city here. Because we’re not acting; we’re just being ourselves.